I have reviewed numerous times the Eduard 1/144 Spitfire Mk.IXs so refer to one of those articles to see what the kit is like. Since there are two models to a box, you may be looking for alternate decals to build different nations' Spitfires. Thankfully Shelf Oddity is another manufacturer catering to that want. 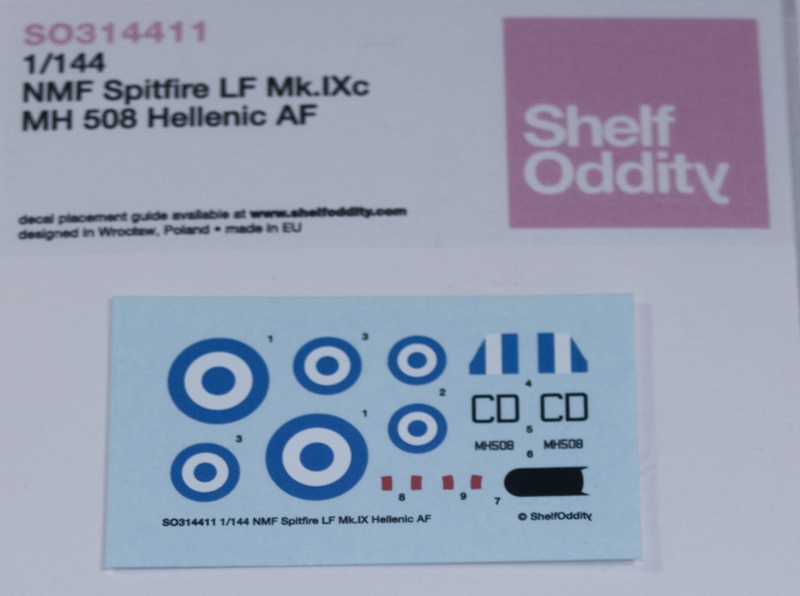 For this release Shelf Oddity has chosen a Greek Spitfire, MH 508 which was an LF Mk.IXc with clipped wings. While it's difficult to create the kit just with one specific Eduard boxing Shelf Oddity recommends using the fuselage from kit number 4428 (which is the Mk.IXe box) and the clipped-wings from kit number 4429 (the Mk.IXc box). The aircraft itself was stripped of paint after delivery and left natural metal while the fabric-covered areas (stabs and rudder) were painted "silver". 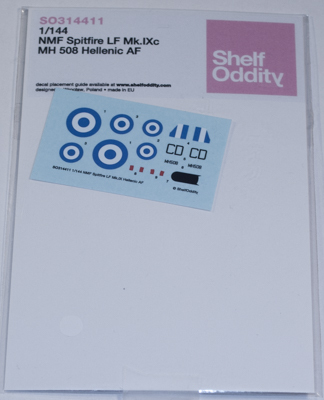 So if you're looking for a different way to finish your Eduard 1/144 Mk.IX (or any other 1/144 Mk.IX kit but Shelf Oddity recommends the Eduard kit) pick up this set of decals. My thanks to Shelf Oddity for the review sample. Keep in mind Shelf Oddity sets do not come with instructions, instead they are downloaded from their site.